There are days where all I can think about is the time Kirill spent in the orphanage. He's been with us for almost three years now. He will be 8 years old in two weeks. I often think about the years before he joined our family-especially around his birthday. I wonder if he remembers the orphanage? Since he's nonverbal he can't tell us these things. Once, his teacher told me they were reading a story about a child in an orphanage in the library. Kirill started screaming and crying (which he almost NEVER does) out of nowhere as if he was hurt. I am sure it was just a coincidence, but it made us all wonder if he understood what the librarian was talking about and somehow made the connection. Who knows...we may never know what he remembers. I pray he doesn't remember anything before he came into our family, but I know he probably does. Even if he doesn't, the scars of spending five years in a crib with little or no outside contact with humans are obvious. They're slowly fading, but still obvious. One thing I do know: Kirill is the strongest person I've ever met. These days when all I can do is linger on the hell of his first five years, I remember when we walked out of the orphanage after meeting him for the first time. Greg and I knew we were walking away from him for months (which would later stretch into almost a year). From our arms, we were sending him back into a cold, isolated existence. I wondered out loud to Greg if he would live until we were allowed to come back for him. Greg held my hand and said, "Tesney, he's going to be ok. He's going to make it. He's a fighter. I can tell." I still don't know if Greg really believed that or if he was just trying to make his heartbroken wife feel more confident. I do know that it proved to be the truth. Kirill is a fighter. He doesn't give up. His persistence is amazing. Even after all he lived through, his spirit is joyful and he has the best smile you've ever seen. I guess I'm writing this just to encourage you. I know we all have bad days; bad months, years, and lives even. However, I can promise you that if Kirill lived through his first 1, 871 days, you can find the strength to keep going. He's my daily reminder that Jesus sustains even when our world is not full of rainbows and unicorns. He's a fighter. I hope you've all entered the giveaway for the Artemis Necklace I'm hosting for the Noonday Blog train. If not, you can find the details HERE. I thought you might all like to know a little more of the story behind the Artemis Necklace. Then I thought about how I never have time to tell ALL the stories behind our pieces at trunk shows. There are literally hundreds of stories. Then I thought, "why not do a series of blog posts highlighting some of my favorite artisan stories?" So here we go! I'm going to post a different story for several posts so you can see for yourself why I am so passionate about Noonday Collection. Let me introduce you to a very special man. His name is Renal and he is from Haiti. 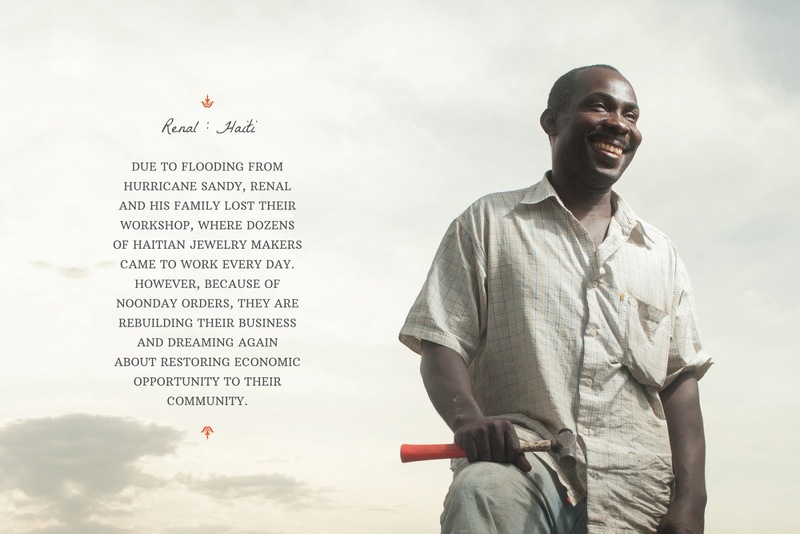 When Hurricane Sandy hit his community, his family lost their workshop that employed many Haitian artisans. They lost their jobs, but they didn't lose hope. Noonday began partnering with Renal to help him build back his business. Because of Noonday's orders for the spring, Renal has been able to employ artisans again and he's bringing hope back to his community. In fact, our home office recently spoke with Renal and he told us his "Tap-Tap" (truck) had been broken down for a long time. Because of Noonday's spring purchases, he had enough income to repair his truck. He's been using it to transport children from his community to and from school each day so they can receive an education! The ripples of Noonday's purchases never cease to amaze me. But it doesn't end there. One of Renal's artisans is a woman with two children who have Sickle Cell Anemia. Her children have accumulated medical bills and she couldn't pay the hospitals for their care. Because the income she's earned working with Renal, filling orders for Noonday, she has been able to not only pay off her medical debt, but she has enrolled both of her children in school full time! So when you see Noonday's beautiful designs, please understand they're so much more than that. It's a the relief a mother feels when no longer has to worry if she can afford medical care for her chronically ill children. It's the peace of mind a shop owner has when he can pay his employees a fair wage and know that they are able to provide for their family's needs. It's the hope of a mother who can afford to send her children to school so they can grow up and have a chance to break the cycle of poverty and oppression. Each time you wear their stories, you are giving them a platform to be lifted out of poverty. You're giving them life. So please, spread the word. Share this post. Share Noonday with your friends, family, and co-workers. Wear Noonday and when someone compliments you on your gorgeous taste, tell them about the artisan that made your accessories and ask them to partner with us too! Also, don't forget...enter the giveaway to win this necklace! It's so stinkin' fierce! I just love it. Hello all you blog train passengers! Welcome to my blog. If you're here for the first time my name is Tesney and I'm so happy you've stopped by! If you've been reading for a while, welcome back! I'm a little late with my post due to my crazy life...it was actually supposed to go up yesterday. The train is not derailed though! It just had a one-day delay and there will be two posts today to catch up...one from me and one from Elizabeth. So if you're just getting on the blog train, be sure to go to Baylor's blog from yesterday and Elizabeth's blog for today. If you know me in real life, you know that I'm never really at a loss for words. Yet, for a couple of years now, I've found it very difficult to blog. So much of what I used to write about was a diary of sorts of my spiritual thoughts. Can I get real with you here? To be quite frank, since we arrived home with Kirill, those thoughts have been consumed with doubt. I know it makes no sense. We were a part of a modern day miracle with his adoption. I felt the Holy Spirit literally took over my body and soul during the last three months of fighting for our son in the Russian Supreme Court. Jesus through us was fierce. However, when I got back home, it was as if I couldn't go back to my previous faith. I couldn't wrap my mind about what had happened. I had never experienced that kind of indwelling of the Holy Spirit and since I couldn't explain it, I started to doubt if it was real. Sometimes the human mind is a tool of the Enemy and I think he made me question a lot of what I had experienced. We also walked through some of the darkest days of our lives after bringing Kirill home. Satan attacked us in ways that we never could have imagined. I won't go into a lot of detail but trust me when I say, some of our worst fears (that had nothing to do with adoption) were suddenly staring us in the face and we had to deal with them while trying to adjust to life with Kirill. I seriously doubted God y'all. For the first time in my life, I just didn't know if he was real and it was scary. Still, in the midst of all of that, I never lost my passion for justice for the poor and oppressed. I think the Holy Spirit was still stirring in me even while I questioned. That's the great thing about Jesus...his grace covers all of our times of questioning. It's ok to wrestle with God. Jacob did it-I figure he's no better than me. Anyway, like I said...I still sought to figure out ways to help bring justice to the poor even in the midst of my doubt. One thing that I learned during our adoption: keeping families together is the best solution to the orphan crisis. Hear me out: I love adoption. I think it's necessary in our world and it's one of the only ways Jesus has shown me the depth of his love for us. It was during this time that I first heard about Noonday Collection. I was intrigued by their purpose: to provide artisans all over the world with a pathway out of poverty. They do this by giving them sustainable income and partnering with them in long-term relationships based on mutual trust. Noonday provides more than just a living wage though; they also provide medical care, no-interest loans, scholarships, and emergency care. Their goal is to provide for their artisans in such a way that they never have to make the difficult decision of whether or not to place their child for adoption due to poverty or illness. I decided to become an ambassador for them because I knew that if Kirill's mom had a Noonday in her life, she would not have had to place him for adoption. Becoming an ambassador has been one of the best decisions I've ever made. I say that because it also brought me hope in very dark times and was a catalyst for me to see Jesus at work all over the world and realize that he IS real. The heart of the Noonday founders and the heart of the women who are ambassadors are unified in our passion to work on behalf of justice for the poor. That unity has created a beautiful mess of people that I've never seen the likes of before in my life. I was able to get together with many of them in January and y'all...no words. We had church! It wasn't a "Christian" event. There are women who are ambassadors and people who love Noonday that aren't Christians (God can use anyone...don't be deceived into thinking he isn't at work in the lives of all people...he loves us all the same). However, the heart and soul of this company, God is driving. He's doing some amazing things through regular women who have chosen to say "yes" to fighting on behalf of the marginalized citizens of humanity. I have never been a part of 400 women who are more united or more positive in my life. We are focused on Jesus. Running the race together and our eyes are not going to the right or the left. If one of us struggles, we ALL struggle. We pray for and support and love and encourage each other so we can keep our eyes focused on the end of the race where Jesus will meet us! If one of us starts to get sidetracked, we all help her get re-focused. It's an amazing group of women, I tell ya, because it's not about us...it's all about him. Luke 12:48 "When someone has been given much, much will be required in return; and when someone has been entrusted with much, even more will be required." then your light will rise in the darkness, and your night will become like the noonday." I think that's why one of my favorite Noonday artisan creations is the Artemis Necklace. I feel this fierceness of Jesus inside of me and this necklace just looks so fierce. It's like a real-life reminder of the armor of God! The story behind it, I'll share tomorrow. I've probably said enough for today plus I've got to go because I've got a Dr. Suess date with my first grader sons! 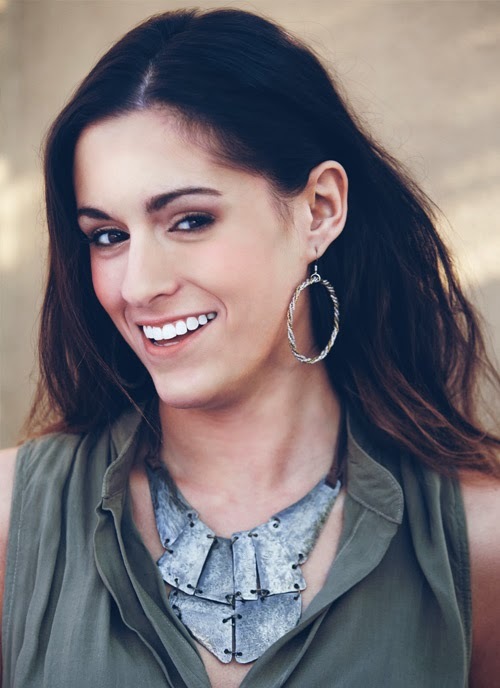 So come back and I'll tell you more about how the Artemis Necklace is changing lives. 2. Share this blog post on Twitter. 3. Share this blog post on Facebook.